Regular classes have resumed. Happy New Year! "The purpose of the Shaolin Culture Center is to improve the physical and mental health of our students, regardless of religious boundaries. We strive to spread the Shaolin culture and be a platform for communication between different cultures around the world." The Shaolin Temple Cultural Center of Arizona (STCCA) is officially sanctioned by Abbot Shi Yongxin of the Shaolin Temple in Henan, China. We are proud to be the newest addition in an ever increasing line of institutes, dedicated to the spread and promotion of Shaolin kung fu and the distinct culture of the Shaolin Temple, across the United States and around the world. Our founder, Master Shi Yanqing, hails from the temple in Henan, China and has travelled all over the state--from Yuma to Sedona and almost everywhere in between--performing and teaching kung fu and Shaolin culture to hundreds of students. Since 2010 STCCA has organized and overseen three trips to China with Arizona students where they were granted access to train inside the temple itself. Planning is underway for a fifth trip in the Summer of 2017. 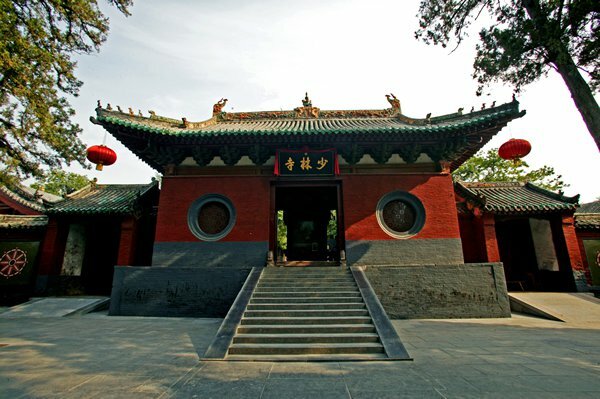 Situated in China's Songshan Mountains, the Shaolin Temple is believed by many to be the birthplace of martial arts. It was built in 495 AD to accommodate an Indian monk translating scriptures, but it was another monk--Bodhidharma-- who put the temple on the map as the origin of Chan Buddhism and kung fu. The temple, Shaolinsi, whose name literally means "temple in the forests of Shaoshi Mountain" has endured a long history of destruction and reconstruction. Today, most of the temple has been restored and it enjoys new-found glory as Buddhists and avid martial artist from around the world flock to its steps. For more information on the Shaolin Temple you can visit their official website. - There is a path to the end of all suffering (The Eightfold Path). Chan, also known as zen, Buddhism focuses on the meditative state. It is based on the belief that all things are interdependent on one another. That without one thing another can not exist. For example, if there are no teachers there can be no students. Conversely, without students there are no teachers. Rather than relying on scripture and dogma, the Chan tradition "focuses on realizing human nature upon sudden attainment of enlightenment." Bodhidharma is recognized as the first Patriarch of Chan Buddhism. He had five successors, all of whom promoted the Chan tradition and continued to aide in its development. After the six Chinese Patriarchs, Chan Buddism developed into five schools: Weiyang, Linji, Caodong, Fayan and Yunmen. One school, Linji, further divided into two separate sects--Yangqi and Huanglong.